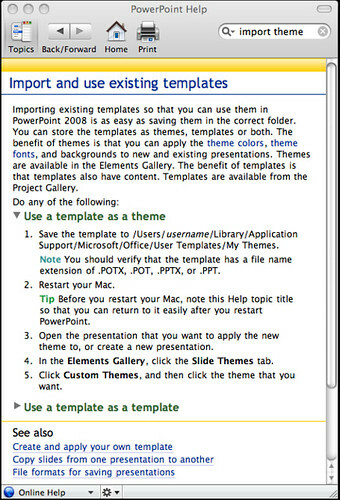 On needing to install a new PowerPoint theme, downloaded from the web, I found these useful instructions in the help menu. Save the template to /Users/username/Library/Application Support/Microsoft/Office/User Templates/My Themes. I suppose these instructions are written for all the Mac switchers. To make them feel at home with Microsoft again. Of course I ignored this instruction, and just closed PowerPoint. When reopened, PowerPoint found the theme and I was able to use it without a problem. This entry was posted in Mac and tagged Mac, Macintosh, Microsoft, Office, PowerPoint. Bookmark the permalink.